The house-complex is located in Goziyon neighborhood, the old section of the city. 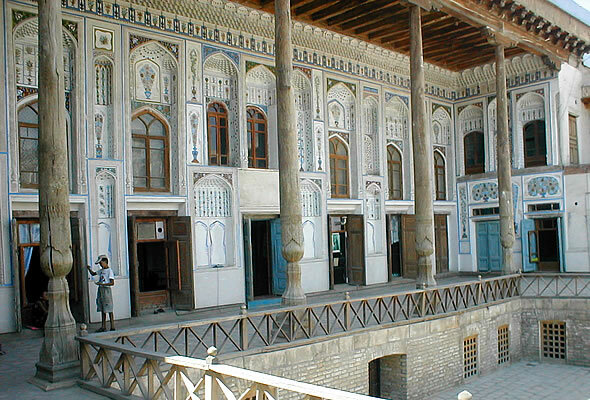 The house belonged to Fayzulla Khojaev’s father Ubaydullokhoja, who was a rich merchant traded in karakul pelt in Russia, Germany and other countries. Fayzulla Khodjaev’s house is a wonderful example of the 19th – century residential architecture. The total area of the building is three hectares. It consists of a household section and havli darun, inside, female area and havli berun, external, male area. The balconies, reception and living rooms of the house demonstrate splendid examples of woodcarving and wall painting. The house-museum has the following exhibitions: the ethnographic exhibition, featuring rich merchants’ life of the 19th- 20th centuries, exhibition devoted to the life of Fayzullo Khodjaev, the outstanding Bukharan statesman, and the “Kitchen of a Wealthy Merchant’s House” exhibition. The exhibits of special interest are the crockery items (19th c.) made in the Gardner and Kuznetsov Russian factories, oriental musical instruments of the 19th century, the silk and velvet clothes of the Bukharans of the late 19th and early 20th centuries, and the 19th -20th – century silver -and copperware of everyday use.